Sometimes carpet cleaning isn't about how dirty the carpet is. It's usually about an annoying spot that you see every time you walk into the room. That's what this carpet cleaning in Odessa FL was about. The home owners dog had gotten ill and soiled the carpet in several places in their bedroom. Their carpet was only a year old and in really good condition. It wasn't do for a professional cleaning for another 6 months or so. These type of unexpected spots need to be taken care of as soon as possible or they become more difficult to remove. 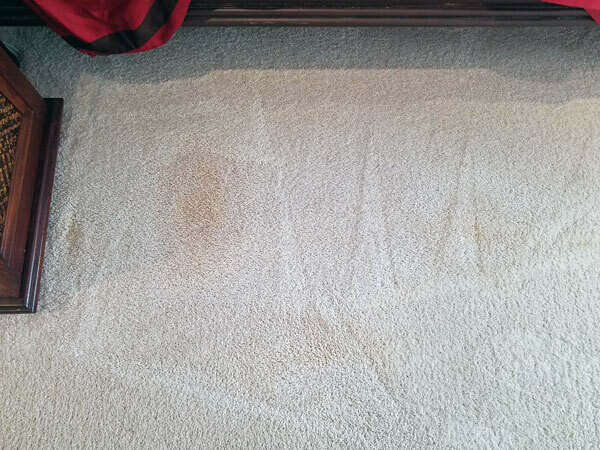 When dealing with biological spills into carpet it's always a good idea to sanitize the carpet as well to make sure there is harmful bacteria in the carpet. It also helps to deodorize the carpet by killing bacteria that emit odors. These Odessa FL home owners had used our cleaning services before in their commercial office space and for some upholstery cleaning, but they had never used our residential carpet cleaning services. After inspecting all the areas in the room where the dog had it's issues I was able to discuss options with the home owner and suggest a course of action to bring her bedroom back to a healthy state. Chem-Dry of Tampa's Healthy home treatment had everything she needed to get her bedroom back to it's like new condition. 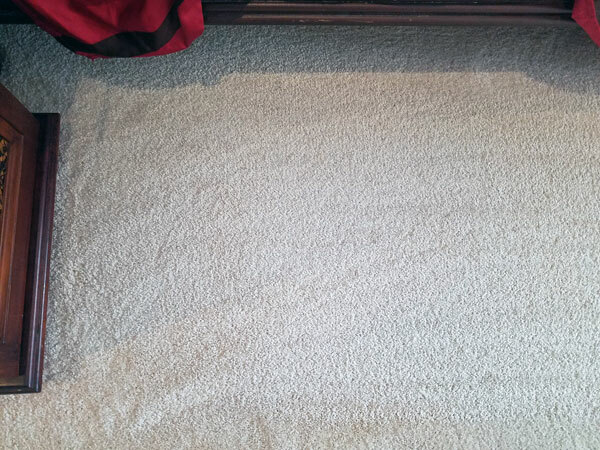 As you can see from the above before and after photos the carpet spots are gone and there is no bacteria or associated odors left behind. Don't settle for a regular carpet cleaning when you can get your carpet cleaned sanitized and deodorized. Your satisfaction is guaranteed. For carpet cleaning in Odessa FL call Chem-Dry of Tampa.